The concrete floor in question was under severe sulphate attack. Due to the underlying soil conditions, the ingress of moisture started the reaction. The concrete floor was removed using air hammers and hauled out of the basement. Abalon recycles. The broken concrete from the basement floor is placed in garbage bins and hauled away to an aggregate recycler. The concrete is then crushed and reused as road base for construction projects. Exhaust fans are placed in the windows to control dust in the house. The work area is sealed off from the rest of the house. After removal of floor Abalon exposed areas of the footing that were found to be cracked. Concrete underpinning pads were poured at these locations. Interior weeping tile was installed around the perimeter of the basement floor, to further control water ingress into the home. Several large cracks were found in the foundation wall. All cracks were repaired from the outside using Abalon’s proven foundation repair methods. Abalon installed 28mm wash rock and 10mm reinforcing steel at 18inches on center. A sump system was installed to remove water from the perimeter weeping tile. 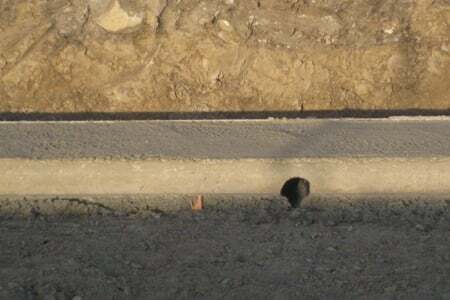 The concrete was placed using a small concrete line pump. The concrete that was used contained sulphate resistant cement. The HVAC systems were suspended to provide for a smooth installation of the concrete floor. The concrete floor was placed and finished using laser leveling technology. Plumbling cleanouts were installed prior to the concrete pour, to provide access to sewer cleanouts as well as the exterior weeping tile system. The finished flat floor is ready for a new basement development.